Planning for Alton Tower’s second hotel began in earnest during 2001 and by September of that year, planning permission was submitted for the new complex, which would include a waterpark and have a Caribbean theme. 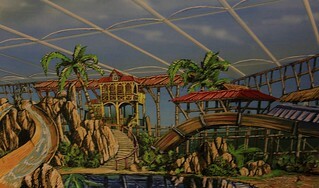 As seen in the early concept art from October 2001, though still recognisable, the original plans for the park were quite different to what was eventually built. As part of the design process, models of the park were also made to allow planners to better understand what the final park might look like. The model based on the 2001 plans showed a different layout for the bridges around the park and was notably missing The Look Out lifeguard station and also seemingly the Volcanic Springs. Whilst later models did include these missing features, the small tree-house neighbouring the Volcanic Springs was still absent, so must have been quite a late addition to the waterpark designs. The original plans also called for a much more involved outdoor section for the park, complete with its own tipping bucket. It would seem that these plans were scaled back late in the project, as publicity material released in 2003 still included the following concept art, which never became reality. Originally the waterpark was intended to be called Splash Landings, but copyright issues early in 2003 meant that the neighbouring hotel became known as the Splash Landing Hotel instead, at which point the waterpark was renamed Cariba Creek. The last minute change meant that the Splash Landings logo, which had been designed for the waterpark, was re-used with the word ‘hotel’ added. Cariba Creek opened its doors to guests on 1st June 2003 in a half-finished state and guests were greeted with a hotel and waterpark mixed with a construction site. It took a few extra weeks for the full portfolio of water park attractions to be completed, at which point the waterpark became a firm favourite with resort guests.